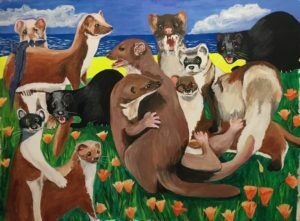 TOO MANY WEASELS , acrylic on canvas, 36" x 48"
Too Many Weasels uses animals as a metaphor: sneaky and sly people. The artist started this painting when she was angry about being treated badly in a store. As she worked on the piece, she began to enjoy the animals so that the anger turned into the fun of the animals.